Which States Have Legalized Weed? On New Year's Day, the law legalizing recreational cannabis, passed in 2016, materializes in California and could allow the state to establish itself as the world's largest planting herb market. The large western US state had already pioneered marijuana for medical use in the United States, allowing it as early as 1996. 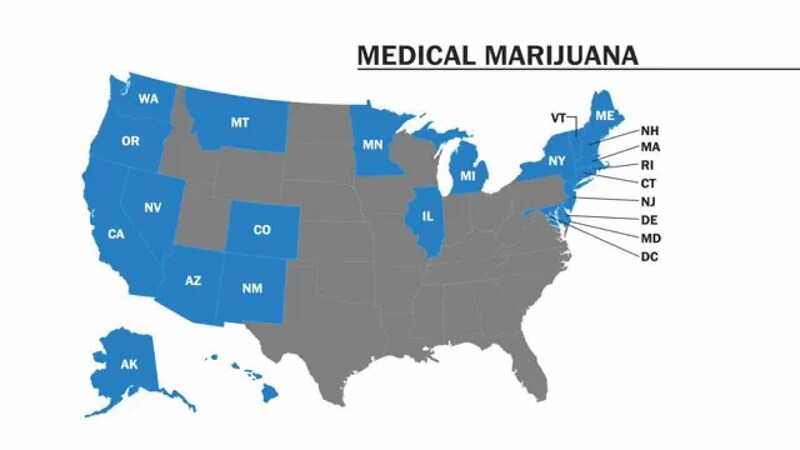 Twenty-two other states have legalized the drug solely for medical purposes. Colorado was the first to vote in 2012 for this amendment on recreational use, followed by Washington. "Now I do not feel like a criminal when I smoke grass," says Matt Johns, a young man from Boulder, a town northwest of Denver, Colorado's capital. In these two states, as of 2014, adults (over 21) have obtained the right to buy cannabis in accredited stores in limited quantities. In six states, a resident can purchase 28 grams. Only Maine authorizes the possession of 75 grams and in the Massachussets the inhabitants have the right to store 280 grams at home and 28 grams in public. Recreational use is permitted only in a private place and not in the street and culture plans must be recorded in a computerized central file. "Nobody calls us if we smoke outside. We do not currently have places for cannabis smokers like coffee shops, but I think it will come in the future, "says Matt Johns. At the federal level, marijuana is still recognized as a category 1 dangerous substance at the same level as heroin and above cocaine. Cannabis use is banned by the federal authorities but Donald Trump has assured the prerogative to the states. Alaska and Oregon legalized recreational marijuana respectively in 2014 and 2015. At the same time as the election of the 45th US President on November 8, 2016, California, Maine, Nevada and Massachusetts, have said "yes" to legal cannabis. Only California is waiting for legal commercialization via specialized stores. On December 8th, the West Coast State opened an online platform to collect applications for licenses from companies wishing to work in cannabis as of January 1, 2018. Cities such as San Francisco, San Diego and San Jose have already issued the permits so that the traders concerned can start sales in the early hours of 2018. Los Angeles, however, has not yet awarded licenses: the first applications will be processed from January 3. In Colorado, where first sales took place in 2014, the cannabis market created 18,000 full-time jobs in three years. Sales generated huge tax revenues, taxes being levied on the sale of cannabis. In the first year, the state imposed a 30% tax. This new business brought him $ 50 million and increased tourism. In total, the taxes levied in one year yielded $ 30 million more, explains Obs. According to the Colorado Constitution, which provides for a maximum tax factor collectible by the state, the surplus had to be returned to the taxpayer. The government was forced to return $ 7.63 to residents. For California, the financial stakes are enormous: the state will charge 15%, plus a sales tax of 10%, and most cities will also impose a municipal tax of 2 to 10%. It is in Nevada that consumers buy the most legal cannabis according to the figures of the site Marijuana business daily. Fifth state health clinics that legalized marijuana for recreational purposes sold $ 27 million worth of grass in the first month of sales in July 2017. That's almost twice the turnover in the first month sales in Oregon (14 million) and more than seven times the amount recorded by the state of Washington (3.8 million). According to an Arc View Market Research study, North Americans spent $ 6.7 billion in 2016 on legal cannabis. That's 34% more than in 2015. Anticannabis feared that younger people and adolescents would smoke or ingest more marijuana. According to a federal study published at the end of the first two years of full legalization (2014-2015), teenage use decreased by 12%. The positive aspects of legalization tend to prevail. This fall would be due to the decline of the black market of dealers. With the opening of adult-only stores, traffic is drying up and teenagers are having a hard time getting supplies. On the other hand, a study has shown that the number of children accidentally ingesting cannabis in Colorado has increased by 150% since 2014. In Washington State, the record is mixed. Marijuana use would have increased by 2% for 13-14 year-olds and by 4% for 15-16 year-olds following legalization in 2015. While overall teen consumption has declined, this is not the case for adults over the age of 18, especially among occasional and regular consumers over 25 years of age. In Oregon, marijuana use increased from 19.5% in 2013 to 23.19% in 2016. Even in Alaska, which saw the number of consumers increase by 19.86% in 2013 to 23 , 46% in 2016.